The House of the Citharist has two main entrances, one opening off the east side of the Via Stabiana and the other opening off the south side of the Via dell'Abbondanza. 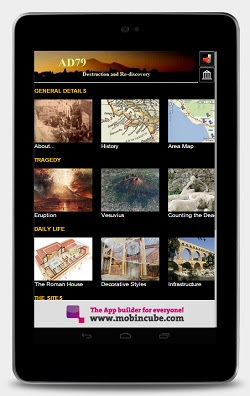 It is one of the Pompeii's largest aristocratic houses, created by joining two houses together; No. 5 (also known as the House of L. Popidius Secundus) and No. 25 (nominally the House of L. Rapinasi Optati). The house was initially excavated between 1853 and 1861 and again in 1868, 1872 and 1929. A wide portal on the south side of the atrium opens onto the first of three peristyles (c) (pictured right). The insula as a whole slopes from north to south and to compensate for the slope the house is built on a series of levels. This first peristyle, being the northernmost, is therefore at the highest level. The peristyle which is colonnaded on all four sides, has a central rectangular garden. The columns sustaining the colonnade are composed of stuccoed brickwork. The oecus (d) in the centre of the east side of the peristyle retains some fresco decoration (pictured above). The room has a marble threshold and is connected to a cubiculum (e) by way of a door in its southern wall. The large room (f) which opens off the west side of the peristyle is a biclinium, but it is in a very poor state of repair with little to show in the way of decoration. A flight of steps on the southern side of the upper peristyle leads down to the middle of the three peristyles (g) (pictured upper right, viewed from the upper peristyle). The area around this middle peristyle was probably the most luxurious part of the house. The south side of the middle peristyle (shown right), which is shared with the lower peristyle, had seven large windows which could be closed with wooden shutters to separate the two areas. The middle peristyle is colonnaded on all four sides with Corinthian columns of stuccoed brickwork. Between the columns, a series of oscilla portraying fauns and bacchantes hung from the entablature (pictured right). In the centre of the peristyle is a rectangular garden with a large piscina near which was found a bronze group featuring a boar being attacked by dogs. A copy of the statue group is on display (pictured right and lower right) while the original statue group, like the statue of Apollo Citharoedus, can be viewed in the National Archaeological Museum of Naples. Also on display is a copy of a bronze snake found in the peristyle (the original, from the National Museum, is pictured below). Cubiculum (l) is basically decorated with a lower red zone topped with a white upper zone. The room has a small window high on its east wall. Cubiculum (m) is slightly more elaborately decorated, with alternating panels of red and white above a lower plain red frieze (pictured right). The red panels have a decorative border while the white panels contain a mixture of faded mythological and pictorial scenes. Off the south side of the middle peristyle are two accesses to the final and lowest of the three peristyles. This lower peristyle (o) is colonnaded on all four sides with fluted columns of stuccoed brickwork and has a central rectangular garden (shown opposite). The two main rooms off the lower peristyle are the exedra (p) and triclinium (q). The walls of the triclinium (q) off the west side of the lower peristyle have lost virtually all of their plasterwork. Like the exedra (p) the central panels contained large mythological scenes. Two of these scenes are sadly lost while the third, depicting the Myth of Io, Argo and Mercury (pictured right) was removed from the north wall and is now in the Naples Archaeological Museum. Returning to the middle peristyle, off the north west corner is the service area including the kitchen and latrine (u). Next to the kitchen is the private bath suite (t), the tepidarium and caldarium of which were supplied with hot water from the furnace in the adjacent kitchen. The fauces (a), pictured left, opens off the south side of the Via dell'Abbondanza onto a rectangular atrium (b) (pictured below) with a central impluvium and puteal (pictured lower left). The walls of the fauces and atrium have lost most of their decorative plasterwork and the remaining plaster fragments are too badly faded to determine the original fresco decoration. The rooms leading off the atrium are in a similar distressed state and although there are plaster remnants in most rooms, the ravages of time and woeful neglect have taken their toll, not only on these rooms, but on the whole of the property, with the consequence that most of the decoration has now been lost. In this peristyle was found the statue of Apollo Citharoedus, after which the house was named. A copy of the statue (pictured left) can be found in the lower peristyle while the original can be seen in the National Archaeological Museum of Naples. Opening off the north east corner of the middle peristyle is a large triclinium (i). The room has lost virtually all of its original plasterwork. On the south wall of the room there was a large mythological scene of Antiope Sleeping by a Stream (pictured lower left) which was removed during the early excavations and is now on display in the National Archaeological Museum. To the south of the triclinium is a cubiculum (j) (pictured below) with an anteroom. The walls of the cubiculum retain large areas of plaster, but the fresco decoration has all but disappeared. The central panels on each wall originally contained large mythological scenes, but these were are removed and taken to the National Archaeological Museum in Naples. The scene on the north wall was of the Love of Mars and Venus (pictured left). On the east wall the scene depicted Apollo and Poseidon at the Court of Laomedon while that on the south wall showed the legend of Leda and the Swan. To the south of cubiculum (i) is a circulation space (K) on the north wall of which was the mythological scene depicting the Judgement of Paris, again now to be found in Naples. 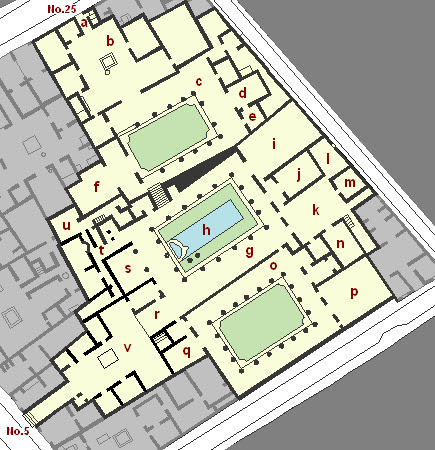 The space gives access to two cubicula (l and m) and a triclinium (n). The walls of the large exedra (p) retain a few patches of plasterwork but these are too faded to allow a reasonable description of the room's decoration. In the centre of each wall was a large mythological scene. The scene on the north wall is sadly lost while those on the east and south walls were removed to the Naples Museum. The scene from the east wall depicts Iphegenia in Tauris while that from the south wall shows Bacchus discovering the Abandoned Ariadne (pictured left). In the centre of the west side of the middle peristyle is a large exedra (s). The room is in a very poor state, with only a few small areas of plaster remaining on the walls. All that can be said of the decoration is that the central zone was mainly red with a dark red lower frieze. A surviving medallion from the west wall of the room which is now in the Naples Archaeological Museum, is pictured left. The tablinum (r) visually links the middle peristyle with the second Tuscan atrium (v). The tablinum, which is fully open on both sides, is raised above the level of the atrium (pictured above) which connected with the peristyle by way on an andon on the north side of the tablinum. Bronze busts of a man and woman, presumably of the owners, were found in the atrium. The bust opposite is also thought to have been found in the house.